Previewed at: Sydney Film Festival screening on 9 June 2017. 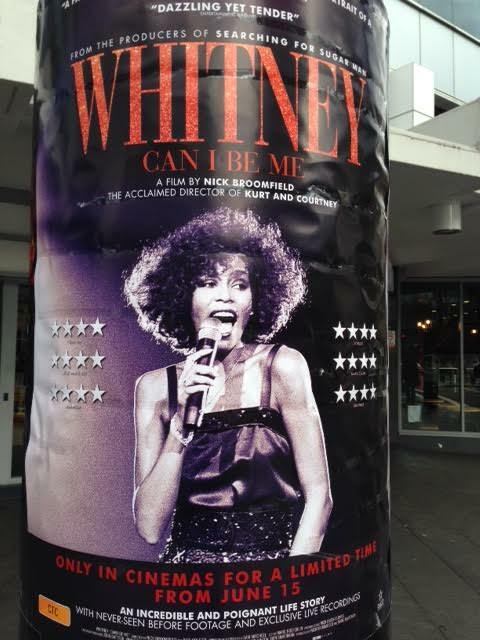 Near the opening of this bio-doc, when Whitney Elizabeth Houston breaks into the final “and I…” of her rendition of Dolly Parton’s I Will Always Love You, it sends shivers down your spine. The singer was recorded in Germany during her 1999 My Love Is Your Love world tour and the strain is beginning to show, not only on her voice but in her demeanor. The footage for Whitney ‘Can I Be Me’ is pretty extraordinary and it’s been artfully compiled by documentarian Nick Broomfield and music video director Rudi Dolezal and edited by Marc Hoeferlin. The performance material was mainly filmed during the European leg of the tour and it’s augmented by a number of archival and more recent interviews with members of her entourage and family plus, importantly, her long-term bodyguard, Welsh ex-cop David Roberts. Born in Newark, New Jersey, in 1963, Whitney’s first solo singing performance was at the age of 11 when she sang with her church’s choir under the direction of her mother Cissy Houston, the gospel and soul singer who greatly influenced Whitney’s life. In 1983, after working as a back-up singer for the likes of Chaka Khan, Lou Rawls and Jermaine Jackson, Whitney signed a significant contract with Clive Davis of Arista records, eventually becoming one of the most awarded female singers of all time with sales of over 200 million albums. According to the documentary, however, money and fame didn’t bring happiness, although it claims her subsequent marriage to bad-boy rapper Bobby Brown and the birth of her daughter Bobbi Kristina gave her some years of contentment. This period was also when Brown’s jealousy caused her to split with her high-school friend and confidant Robyn Crawford, with whom many assumed she had a lesbian relationship, and it hurt. Poor Whitney is depicted as a manipulated, generous soul, who had to contend not only with a mother who lived vicariously through her daughter’s career but also a father who eventually sued her for $100 million. She adored her own daughter but had to spend long periods apart from her because of the requirements of recording and touring contracts (sadly, Bobbi Kristina would ultimately suffer the same untimely, drug-induced death as Whitney). It seems cocaine abuse was pretty constant throughout the singer’s career, like so many other talented artists, but it got worse during the years of her marriage to Brown.